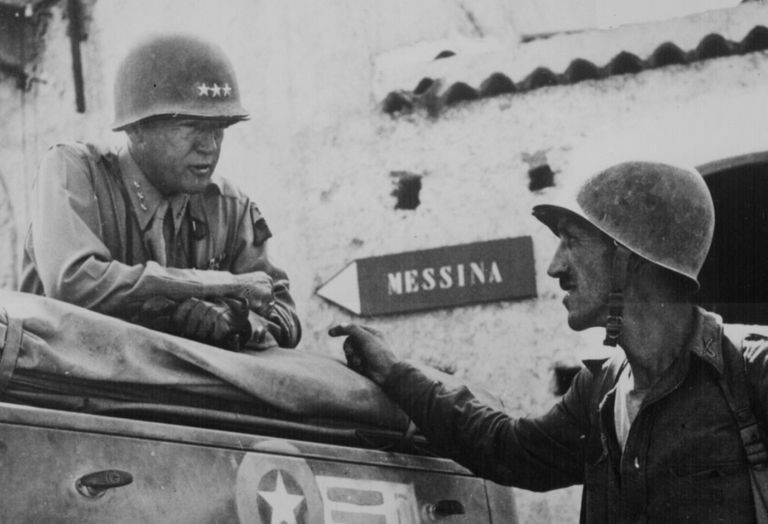 Lt. Gen. George Patton with Lt. Col. Lyle Bernard during the Sicily Campaign, 1943. Conflict: Operation Husky was the Allied landings on Sicily in July 1943. Dates: Allied troops landed on July 9, 1943, and officially secured the island on August 17, 1943. In January 1943, British and American leaders met at Casablanca to discuss operations for after Axis forces had been driven from North Africa. During the meetings, the British lobbied in favor of invading either Sicily or Sardinia as they believed either could lead to the fall of Benito Mussolini's government as well as could encourage Turkey to join the Allies. Though the American delegation, led by President Franklin D. Roosevelt, was initially reluctant to continue an advance in the Mediterranean, it conceded to British wishes to move forward in the region as both sides concluded that it would not be feasible to conduct landings in France that year and capture of Sicily would reduce Allied shipping losses to Axis aircraft. Dubbed Operation Husky, General Dwight D. Eisenhower was given overall command with British General Sir Harold Alexander designated as the ground commander. Supporting Alexander would be naval forces led by Admiral of the Fleet Andrew Cunningham and the air forces would be overseen by Air Chief Marshal Arthur Tedder. The principle troops for the assault were the US 7th Army under Lieutenant General George S. Patton and the British Eighth Army under General Sir Bernard Montgomery. Initial planning for the operation suffered as the commanders involved were still conducting active operations in Tunisia. In May, Eisenhower finally approved a plan which called for Allied forces to be landed in the southeastern corner of the island. This would see Patton's 7th Army come ashore in the Gulf of Gela while Montgomery's men landed further east on both sides of Cape Passero. A gap of around 25 miles would initially separate the two beachheads. Once ashore, Alexander intended to consolidate along a line between Licata and Catania before conducting an offensive north to Santo Stefano with the intention of splitting the island in two. Patton's assault would be supported by the US 82nd Airborne Division which would be dropped behind Gela before the landings. On the night of July 9/10, Allied airborne units began landing, while American and British ground forces came ashore three hours later in the Gulf of Gela and south of Syracuse respectively. Difficult weather and organizational miscues hampered both sets of landings. As the defenders had not planned on conducting a pitched battle on the beaches, these issues did not damage the Allies' chances for success. The Allied advance initially suffered from a lack of coordination between US and British forces as Montgomery pushed northeast towards the strategic port of Messina and Patton pushed north and west. Visiting the island on July 12, Field Marshall Albert Kesselring concluded that their Italian allies were poorly supporting German forces. As a result, he recommended that reinforcements be sent to Sicily and the western side of the island be abandoned. German troops were further ordered to delay the Allied advance while a defensive line was prepared in front of Mount Etna. This was to extend south from the north coast towards Troina before turning east. Pressing up the east coast, Montgomery attacked towards Catania while also pushing through Vizzini in the mountains. In both cases, the British met strong opposition. As Montgomery's army began to get bogged down, Alexander ordered the Americans to shift east and protect the British left flank. Seeking a more important role for his men, Patton sent a reconnaissance in force towards the island's capital, Palermo. When Alexander radioed the Americans to stop their advance, Patton claimed the orders were "garbled in transmission" and pushed on to take the city. The fall of Palermo helped spur Mussolini's overthrow in Rome. With Patton in position on the north coast, Alexander ordered a two-prong assault on Messina, hoping to take the city before Axis forces could evacuate the island. Driving hard, Patton entered the city on August 17, a few hours after the last Axis troops departed and a few hours before Montgomery. In the fighting on Sicily, the Allies suffered 23,934 casualties while Axis forces incurred 29,000 and 140,000 captured. The fall of Palermo led to the collapse of Benito Mussolini's government in Rome. The successful campaign taught the Allies valuable lessons that were utilized the following year on D-Day. Allied forces continued their campaign in the Mediterranean in September when landings commenced on the Italian mainland.